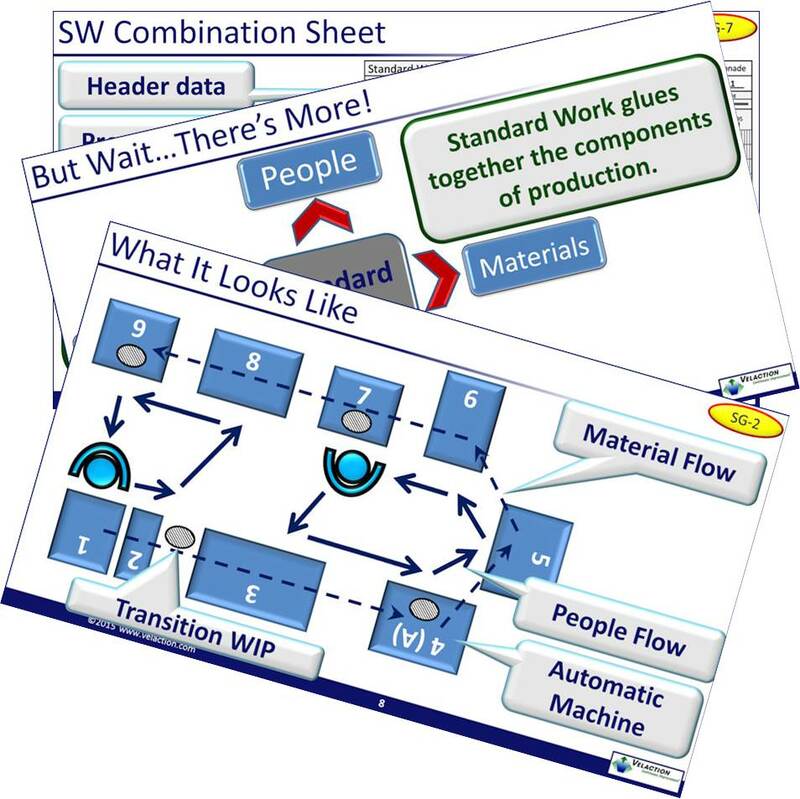 Standard Work is one of the bread and butter concepts of Lean. Basically, Standard Work is a very specialized form of standardization that balances a precise sequence of work for a single operator to a takt time. And that sequence, by default, also defines the amount of standard work-in-process that will be present at any given time. Effective Standard Work has a tremendous impact on quality, delivery, cost, safety, and morale, making it one of the broadest reaching tool in the Lean toolkit. It also acts as an amplifier for many of the other tools and principles. Kanban, andon, flow, poka yokes, and many others are all made more effective when they are building off the stable platform that Standard Work provides. Standard Work also powers the plan-do-check-act cycle. Taiichi Ohno once said that "Without standards, there can be no kaizen." Standard Work prevents the backsliding that prevents continuous progress with the improvement cycle. We offer our download links through email. Simply fill out the form to the right to become a member and get your Standard Work downloads delivered via email. Membership is free and you can quit whenever you want. As long as you are actively subscribed to one of our lists, you are entitled to member benefits. That means you can get over a hundred downloads for free. If you don't want to keep receiving emails, simply unsubscribe at the bottom of any message you receive. Just keep in mind that you'll have to cancel all lists in order to stop receiving our updates. If this is the first time you've contacted us, you'll have to confirm your email address. If you are already a member or a previous customer, all you have to do is fill out the form to the right to get our Standard Work content for free. Visit our member download page for information on troubleshooting. Standard Work materials are included in the following value packs. They are also include in the Independent Study Pack and the Instructor Pack listed below. Contains instructor materials, videos, and audio for Phase 4. Contains instructor materials for modules from Phase 4. Contains corporate licenses for videos from Phase 4. This product contains the 7 DVDs in Phase 4, "Building the Foundation", of our Lean Training System. Contains corporate licenses for audio programs from Phase 4. Download option available. Contains reference materials from Phase 4. Download option available. Contains Standard Work Overview training materials. 9-page Cycle Time Term on PDF. "Standard Work in 8 (Not So) Easy Steps" Article on PDF. Standard Work-in-Process Term on PDF. A screen capture and high quality recording of Velaction's Standard Work Overview training on DVD. Corporate license for the Standard Work Overview PowerPoint presentation. Corporate license for the Standard Work Overview student guide. License for the Standard Work Overview video. See the license terms on our site for full details. Video file delivered via immediate download. Standard Work Term on PDF. Corporate license for our 96-Page Structuring Standard Work downloadable Lean tutorial. All active employees of the company listed on the ship to address may use. Restrictions apply. Takt Time Term on PDF.